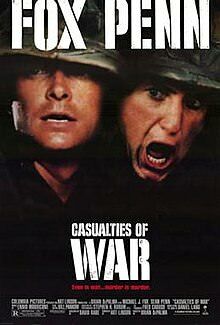 Casualties of War is a 1989 American war drama film directed by Brian De Palma, with a screenplay by David Rabe, based on the events of the incident on Hill 192 in 1966 during the Vietnam War. The picture stars Michael J. Fox and Sean Penn. An article written by Daniel Lang for The New Yorker in 1969 and a subsequent book were the movie’s primary sources. The story is presented as a flashback of Max Eriksson, a Vietnam veteran. Lt. Reilly leads his platoon of American soldiers on a nighttime patrol. They are attacked by the Viet Cong (VC) after a panicked soldier exposes their position. While guarding the platoon’s flank, Eriksson falls as the top of a VC tunnel gives way beneath him. Eriksson’s squad leader, Sergeant Tony Meserve, pulls Eriksson out of the hole and eventually, the platoon retreats out of the jungle. Hi. All links are down. Thanks.